eL Seed's Tabula Rasa, installation view. Courtesy of Lazinc. LONDON.- Lazinc is presenting Tabula Rasa, a solo exhibition of new works by contemporary Tunisian-French artist, eL Seed. The exhibition sees the launch of Lazincs 2019 programme and celebrates the gallerys first year anniversary at 29 Sackville Street. 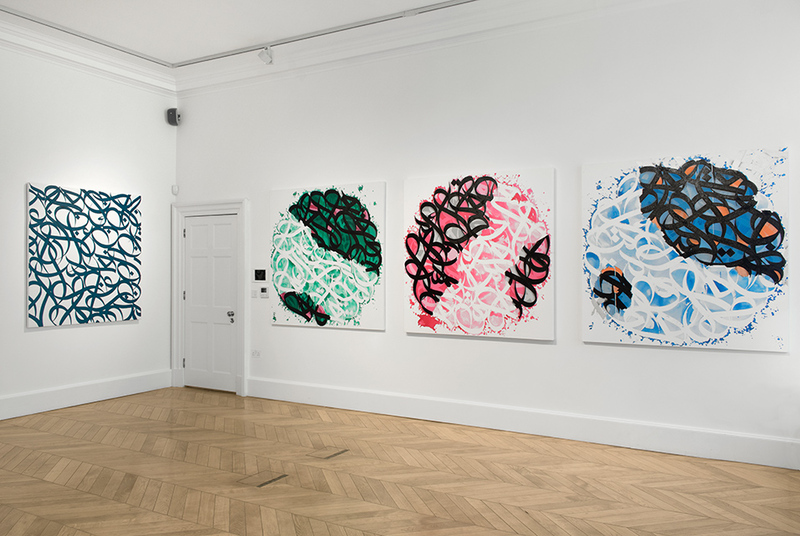 eL Seeds first UK exhibition showcases a range of acrylic on canvas paintings, which incorporate the artists signature style: an adaptation of traditional Arabic calligraphy. Within the intricate compositions, he emphasises the curves and loops of the script removing a layer of legibility and adding mystery to the meaning behind the words he chooses. Glenn D. Lowry, Director of Museum of Modern Art (MoMA) has described eL Seeds recent public mural in Cairo as a metaphor for seeing what had been previously invisible; the dignity and richness of the lives of the Coptic community of Zaraeeb. Tabula Rasa at Lazinc builds on eL Seeds continued engagement with the Arabic script, the artworks not only invoke the words and their meaning but also their movement. For this exhibition, the artist has developed on his process, stripping down the works, in an effort to access his own tabula rasa. The concept of tabula rasa, pioneered by 17th Century philosopher, John Locke, argues that at birth the human mind is a complete, but receptive blank slate, upon which experience imprints knowledge. In relation to his canvases, eL Seed has taken the idea of the tabula rasa as a starting point, with the aim to alter deep-seated preconceptions that are commonly held about the Arabic script and culture. In contrast to eL Seeds usually polished and perfected canvases, the works at Lazinc appear with an unfinished aesthetic. The surface calligraphy is ripped and torn to reveal phrases and imagery below, which materialise slowly and differently with each viewing. The layering of words and ideas offer an insight into the thought process of the artist. Audiences are allowed access to eL Seeds investigation of whether one is able to remove other influences and start a project with fresh eyes, or, if as Locke said, all that we make is actually the product of what has come before. Guests are invited to reconsider all that they previously thought about Arabic and immerse themselves in the calligraphic experience. eL Seeds intricate calligraphic compositions call not only on the words and their meaning but also on their movement. eL Seeds art reacts to the reality of mankind and the world we live in today. eL Seed has installed his work in public spaces, galleries and institutions on every continent and recently launched his most recent book Perception at MoMA in New York. In 2017, he won the UNESCO Sharjah Prize for Arab Culture. He was named a Global Thinker in 2016 by Foreign Policy for his project Perception in Cairo. In 2013, he collaborated with Louis Vuitton on their famous Foulard dArtiste.